Effective Monday, December 4, the UNMCCC IT department will be taking over all telephone and telecom support for all of our Cancer Center facilities. While we do not directly administer our telecommunications systems, we would like to have all telecommunications related issues processed through IT so that we can help monitor and track the status of these requests. Over the next couple of weeks, we will be modifying our ticket portal to add a telecom request link. In the meantime, we would request that you use the Desktop and Laptop Support request link for all telecom requests. In your request, please note that this is for Telecom or Telephone related services and provide information about the nature of the request, i.e., New Phone(s), Phone Move, Broken Phone, Poor Connection Problems, Additional Services (ex: Voice-Mail), etc. Also, please remember to always include a Name, Location and Contact Information. Once a telecom-specific link is set up a follow-up e-mail will be sent out with any additional information or instructions. We do not manage or administer our own telephone or voice-mail systems. All telecom services are handled through UNM Telecom Services. We are simply centralizing Cancer Center and CRF requests to help manage and expedite telecom related requests as much as possible. New telephone orders can take up to two weeks, so please plan accordingly for new hires or expansions. Orders for 6 or more phones are handled by a special projects group at UNM Telecom and will take 2 to 4 weeks, so once again, please plan accordingly. UNM Telecom is required by Federal and State regulations to track the location of all extensions, specifically for 911 service calls. Please DO NOT move telephones without notifying us. 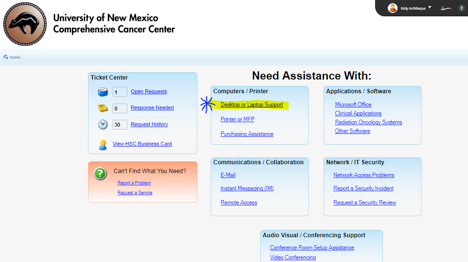 We will gladly help with phone moves and we will communicate the required information to UNM Telecom. All additional services and/or equipment need to be ordered using our ticketing system and we will process these orders through UNM Telecom. ANY equipment that is ordered directly such as headsets, extension cords, etc. will not be supported by us or by UNM Telecom. Expedited requests WILL incur a substantial expedite fee and these fees will be charged directly to the requesting department. Please keep an eye out for additional information as we get our ticketing system updated to include links and forms for telecom and telephone support requests. Thank you for your cooperation and patience as we transition through this change.